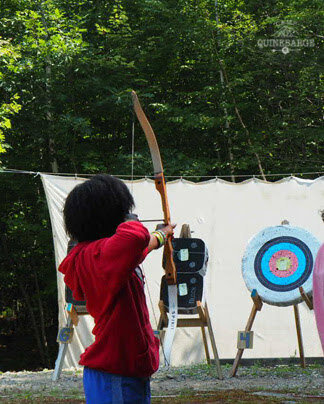 Looking for an archery camp in New Hampshire? Quinebarge may be a little different than it looked to our first campers in 1936, but one thing that will never change is our love of archery. Within our all-elective, camper’s choice approach to programming, archery is a unique and fun activity that can’t often be found outside of camp. Archers of all ages and abilities have a blast each summer, shooting bullseyes and trying to make each shot a little better than the last. 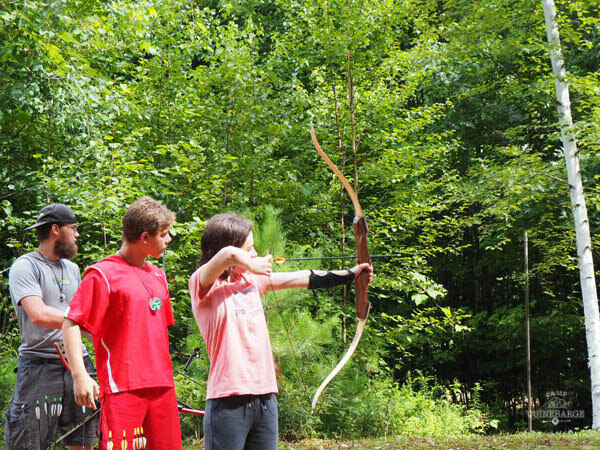 Each summer, archery is among our most popular sports activities. Campers who participate in sports can select from land sports, tennis, archery, or biking on a daily basis, ensuring variety – and fun – in their schedule. Qualified coaches teach campers everything from the basics of range safety and shooting, to advanced skills and challenges for sharpshooters. No matter what your camper’s age or skill level, they’ll have fun, be safe, and grow in confidence. Now that’s a bullseye! A summer at Camp Quinebarge is about more than simply having fun. Our campers leave Quinebarge happier, more independent, and more resilient than when they arrived. Campers build confidence, learn new skills, and expand their horizons over the course of their stay. And of course, each camper will go home having made or strengthened friendships that will last a lifetime.